When you are entering information into MoneyWorks you may not be able to remember what the code is for a customer, product, account or whatever. MoneyWorks has two mechanisms to help you. A drop down list appears under the entry field displaying the possible candidates based on what you have thus far typed into the field. Candidates are selected if their code, or any word in the description/name, starts with whatever you have typed. A Choices List is displayed of all candidates if you tab out of a field that requires a code, but in which no valid code has been entered. There is a difference in how these work. The drop down list will only appear when the number of available candidates is manageable (less than 20), and will only show those candidates. The choices window will show all possible choices (subject only to the selected list filter), and attempt to match based on the first characters of the sorted column only. Unlike the drop down lists, the Choices list searches only on the code field. Note: Codes whose first character is a tilde “~” are not displayed in the Choices or drop down lists—these are considered to be no longer in use. Note: You can set up your own drop-down lists and choices lists for non-code fields by using Custom Validations. When entering into a code field (such as an account code, product code, customer code etc), a drop down list of all items whose code starts with what you typed (or which have a word in their description that starts with what you have typed) will be displayed, provided there are no more than 20 possible matches. Note: Drop down lists can be disabled in the MoneyWorks Preference settings —see Show auto-fill dropdowns; you may want to do this if operating over a slow network. 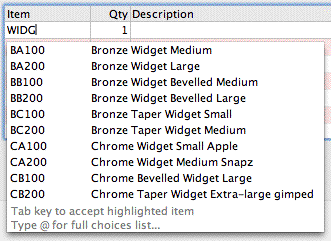 When a drop down list appears, you can down arrow or double-click on the desired item. The code for this will be inserted into the field.